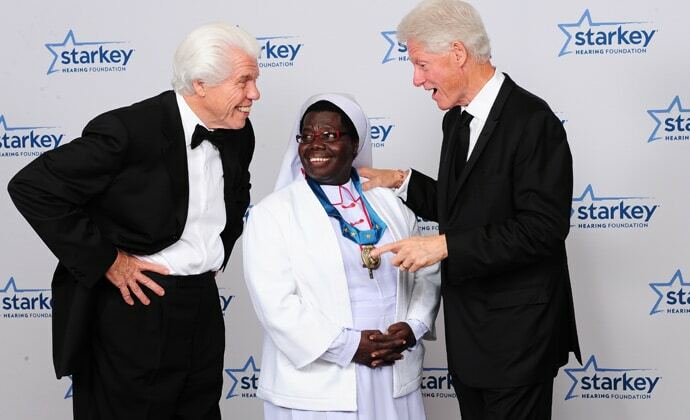 Bill Austin, left, and Bill Clinton congratulate Sister Rosemary Nyirumbe, one of the honorees at the Gala. ST.PAUL–Actors, athletes, astronauts, musicians, and a former President of the United States were among the scores of celebrities who took part August 4 at the 12th annual So the World May Hear Gala, which raised a record-breaking $7.6 million for the Starkey Hearing Foundation. Founded by Bill Austin, principal owner of Starkey Hearing Technology, the foundation donates more than 100,000 hearing aids a year to children and adults in need around the world. So the World May Hear, which drew nearly 1500 attendees this year, is the single biggest fund-raising event for the cause. Several awards were presented to people for their humanitarian efforts on behalf of those with hearing loss. 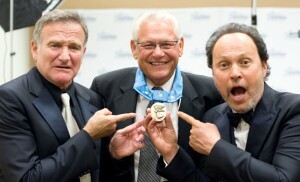 Recipients included Sister Rosemary Nyirumbe of St. Monica’s School in Uganda; the actress Maria Bello for her work with her foundation in Haiti; philanthropists Glenn and Mindy Stearns; and John Johnson, the former CEO of the agriculture cooperative CHS, Inc.
Comedians Robin Williams, left, and Billy Crystal, right, admire John Johnson’s award. Presenters at the gala, which was held at the St. Paul’s River Centre, included former President Bill Clinton; the comedians Robin Williams, Billy Crystal, and Chevy Chase; and the actor Forest Whitaker. Among those who performed at the gala were Steve Martin & the Steep Canyon Rangers, Billy Ray Cyrus, K’NAAN, and Glenn Frey. Among the many celebrity guests were actors (including Marlee Matlin and Lou Ferrigno); figures from the sports world (John Calipari, Tony Hawk, Pedro Martinez, Sammy Sosa, Ed “Too Tall” Jones,” and Rollie Fingers); and the astronauts Buzz Aldrin and Scott Carpenter. More about the Gala and the Starkey Hearing Foundation is available online.